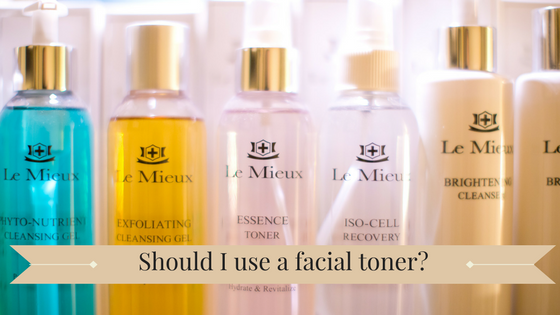 Should I use a facial toner? Yes! Here's why you need one. Should I use a facial toner? Yes! You should definitely use a facial toner. You should select one that matches your skin type and skin care goals to be part of your skin care routine. In fact, you should think of toner as the final step in your cleansing routine, not just as a nice thing to add on! You use a facial toner tohelp remove any dirt, bacteria or other impurities that are looming around after you wash your face. Some cleansers may contain oils or other ingredients that are easily left behind on the skin. When your face is not fully clean, it can lead to clogged pores, which ultimately leads to blemishes, wrinkles and a whole lot of other stuff! Going over your face with a toner, can help eliminate anything remaining on your skin and prime your skin for your moisturizer. Aside from what I just said about thoroughly cleaning your skin, there are a number of other benefits to using a toner. Using a toner can help minimize the appearance of your pores. It also adds an additional layer of protection to your skin by helping to hold in moisture. Overall, a toner will help refresh your face! Don’t toners contain harsh chemicals? Some toners do. Like many other skin care products, all toners are not created equal. You may find some that are nothing but chemicals and those you should steer clear of. They dry out your face and do more harm than good. I have a several toners in stock that don’t contain harsh chemicals but still get the job done. I have several great toners from Le Mieux that I carry and recommend. I’d be happy to suggest a toner based on your skin and your goals. Just like your skin care, your toner should be a product that works with current skin condition. How do I use a facial toner? After washing your face thoroughly with the cleansing products we’ve determined are the best fit for you, I recommend you use a toner as your final step. Spray your toner on to a cotton pad. Get enough on there to saturate the pad. Then gently whip the pad over your face and neck. You should use your toner during your morning and evening cleanse. Give your face a moment to dry up, then continue with your skin care regime by adding your moisturizers and makeup. If you have questions about the products you’re using, or would like recommendations on a good facial toner to use, contact me!